I’ve always preferred teaching adults to teens and young learners, though just occasionally being able to run a good teen/YL class can be a great boost to my confidence. Erica Napoli Rottstock’s post has some useful tips that could make a real difference next time I head into the teen classroom! I am pretty sure that on seeing the heading to this article you will have immediately and unconsciously nodded your head and maybe added a decisive ‘no way’. As a matter of fact, teenagers are often seen as moody and undisciplined and their lack of motivation can be a ‘nightmare’ if we are teachers. However, taking a break to teach teens can be a real boost for demotivated teachers, an unexpectedly refreshing experience that ripples through to the rest of your EFL praxis. I think everyone has experienced times when things don’t go as we assume; maybe you have felt tired and demotivated. The first thing to do is to find the real reason why you have lost your enthusiasm. If you think you need more fun and you strongly believe that connecting with people can help you, in this case a change is as good as a rest. Taking time out to work outside of one’s comfort zone may bring new inspiration to routine, in this case take also some time to watch this inspiring TED talk. Based on my personal experience, one year teaching in a teen class could be your solution. The first thing to consider is that the so-called moody, undisciplined teens’ behaviour is strongly influenced by how teens’ brains are wired, ruled by the limbic system, since the frontal lobe, specifically responsible for controlling emotions, takes significantly longer to develop. This may be the reason for their short attention span, their laziness or lack of interest, but on the other hand teens are ready to get involved very easily. A trustworthy teacher with an engaging topic will soon spot ways of driving and channelling such traits. Secondly, allow for flexibility. We can be less like control freaks and thus much more likely to enjoy the lesson. Even if we have a syllabus to follow, we can still be flexible. Interestingly enough, by releasing control, we gain students’ trust and attention. Surprisingly, if you listen to them, you get their attention and you feel less tired! I would suggest you enter the class with a multiple-option lesson plan – say a plan where you let your students decide how to develop it. I have noticed that if you start your lesson with a sort of declaration of intent, teen students are happy to follow you and are extremely pro-active. This environment is stimulating for their learning and also a boost for ‘tired teachers’. Even classroom management can become less stressful if you can let students move freely in their class, choose their peers for their activities and decide when they need a break. By respecting their pace you can have less stress indeed. The third thing to consider is that teens are very curious, so when you teach them you can make your lesson very personal and arouse their interest. Clearly, this doesn’t mean sharing one’s closest personal issues. You can simply offer up your point of view, your personal opinions, bringing an element of humanity and showing we are far from being superheroes. I can assure you that this is not only very conducive to learning but also very positive for your well-being. Last but not least, the environment of your class will become more relaxed and you can simply work on emergent language without wasting any opportunity for learning. Besides, you will notice that students themselves will ask you to practise more if they become aware of their limits. Teaching teens becomes a real boost, if you consider a more autonomous learner approach. You can foster students’ autonomy by developing their awareness with self-assessment, you may guide students to be aware of their own weaknesses and strengths, with a reduction of your workload or at least less time-consuming ways to evaluate your students. Also, I recommend stimulating learning beyond the class, so that you can build a deeper rapport with your students, as you can understand their needs and interests better. In my experience, WhatsApp was extremely useful, not only in terms of conducting on-going class service communication and light conversations outside the classroom, but also when it came to assigning/performing and giving feedback on written, oral and aural homework (short writing/speaking tasks performed via voice and video recordings and text messages). This particular means of communication provides the added value of reduced practitioner workload in terms of evaluating learner performance on a day-to-day basis. We ask parents’ permission to have WhatsApp groups with students when they join the school. To sum up, if you want to feel regenerated, go for a teen class; they have an extremely positive attitude provided one is prepared to embrace flexibility and promote autonomy. Erica is a DELTA-qualified teacher with an MA in foreign literature. She has been teaching English for more than 15 years, but she likes to be considered as a life-long learner herself. Previously DoS and founder of a little private language school in Milan, she then decided to become a full-time teacher at high school and she’s currently engaged teaching teens at Istituto Europeo Leopardi in Milan. This article is based on her talk from IATEFL Brighton in April 2018. On 23rd September 2015 I went back into the classroom properly for the first time in over a year, teaching my first class with a B1 intermediate teen group who will be my students for the whole academic year. As a CELTA trainer in 2014-2015, the only opportunities I’ve had to teach English have been in one-off demo lessons, which aren’t quite the same. I’ve had a lot of opportunities to reflect on my teaching, seeing trainees do things I know I’ve often been guilty of, then offering advice about how to get over problems like over-complicated instructions and poorly timed lessons. Time to see if I could practise what I preached! Out of curiosity and intrigue, and as a means of reflection, write what you did in your class(es) today, from checking attendance to giving a test to blowing students’ minds with the most dogme-inspired, task-based, mobile-assisted, coursebook-free, PARSNIP-full lesson non-plan ever. You don’t have to explain why, unless you’d like. Just give the raw, nitty-gritty details. Circle game: to learn each others’ names. There are nine students, four girls and five boys, aged 13-15. This took about 10 minutes. Getting to know you: I demonstrated a triangle on the board with three pieces of information about me. In pairs, students had to guess why the information is important to me. Listening back I didn’t give them enough time to guess (less than a minute), so only stronger students contributed in the open class stage. A couple of the boys decided the triangle was an Illuminati symbol, added an eye, and have since put it on the whiteboard at the beginning of every lesson. Students wrote their own triangle with information on it. They had plenty of time to do this. Mingle: students had to find out about their classmates. Instructions have always been a problem for me, and although they have improved a lot, the way I set up this activity wasn’t completely clear. The instructions themselves were fine, but to make it completely clear I should have done a T-SS and a SS-SS demo first. I thought the demo I’d done with my information would be enough, but I didn’t factor in that students needed to make notes based on what they heard. I also didn’t specify before the activity that I wanted them to speak English only, so some of the boys were making it a race at the beginning and doing it in Polish. They had about ten minutes, but it could have been shorter if I’d been clearer. 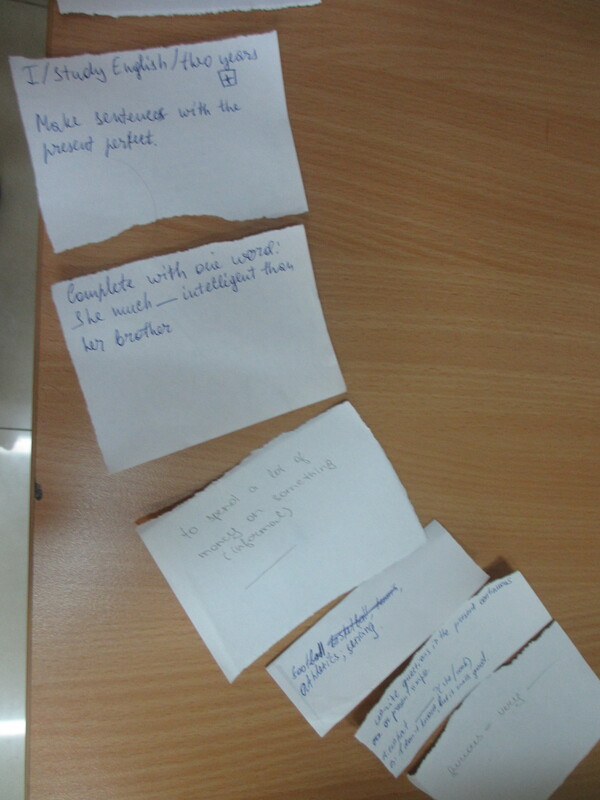 Pair check: students tried to remember one thing about each person in the class. Here I had to remind them to expand on what they said, as some of them started with e.g. ‘Sandy – blue, M – cat’ instead of making full sentences. K points: this is the school-wide points system used for teen classes. I introduced it to them, telling them what they needed to do to win points as a class, and what would mean losing points. Five of the students had the system last year, so I should probably have got them to explain it (especially because it’s new to me!) but I didn’t think about that until afterwards. Break time: students have ten minutes to go to the club, a room at the bottom of the school with vending machines, tables and places to sit. The teacher goes with them, and if they behave well, they get K points on their return to class. I showed students the image above. We have projectors and netbooks, but they were still being prepared when I did the lesson, so they were printed on a couple of A4 sheets in black and white. In pairs, students had to say what’s happening, who the people are and where they are. One student immediately said ‘capoiera’ to the whole class, which kind of stalled the conversation! I still got them to predict in pairs, then asked that student to fill in the gaps once they’d shared their ideas. 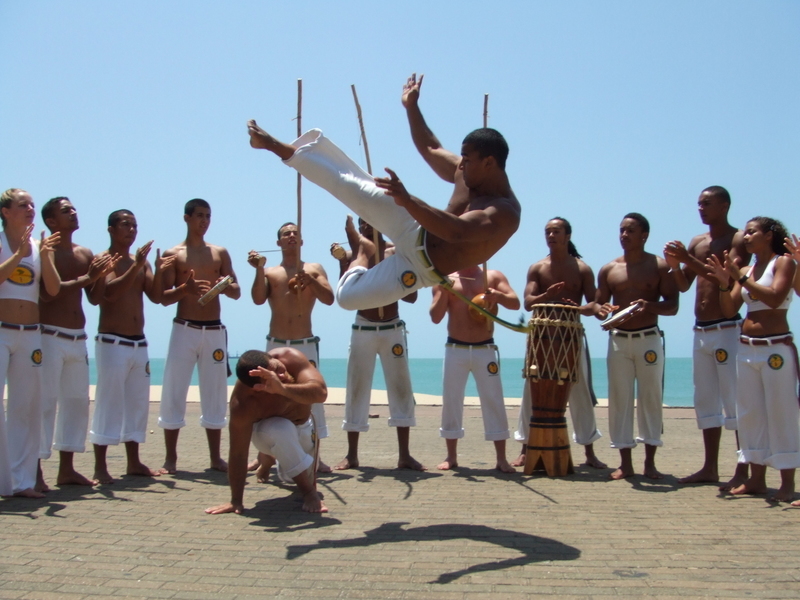 ‘Capoeira’ was drilled briefly as students would need to say it a few times during the lesson. I wasn’t bothered about spelling or being completely correct though, since it’s not a high-frequency word for this group. Gist reading: students read the text and matched four titles to the four paragraphs. Feedback: students checked in pairs, then I read the answers and they confirmed them. The whole feedback stage took less than a minute. From my monitoring while they read I knew most students had got it right already, but one student hadn’t. Reading for detail: yes/no/not given task. I demonstrated it first, showing students they needed to underline the answer in the text and write the question number next to it. Students did this without a problem. Meanwhile I was monitoring, and checking answers from fast finishers. 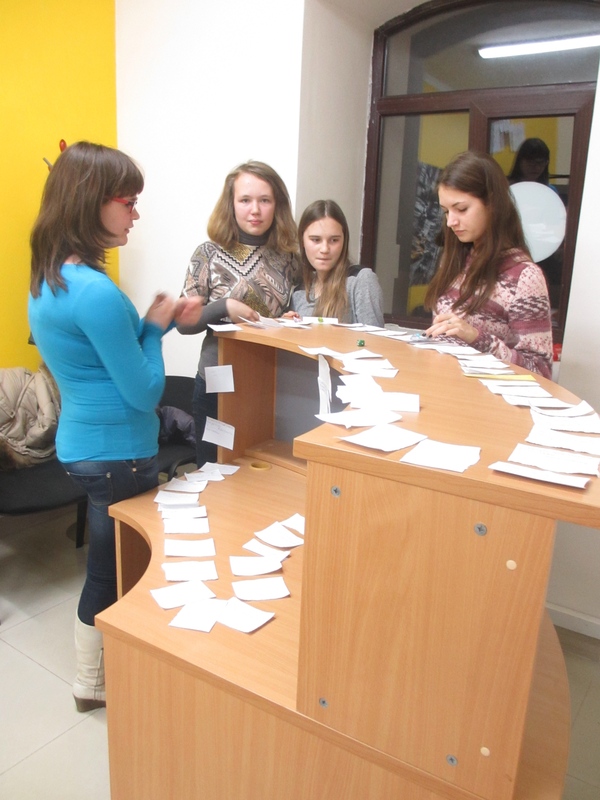 They became the teachers and checked specified students’ answers. Feedback: We only focussed on question 6, as students had the rest of the answers. There was a problem with an item of vocab (‘slave’) which I should probably have pre-taught, but it came up in the following vocabulary task too, so I’d decided not to. Oops. I gave them an example and got them to look at the text again for number 6, making sure they all underlined the right sentence. 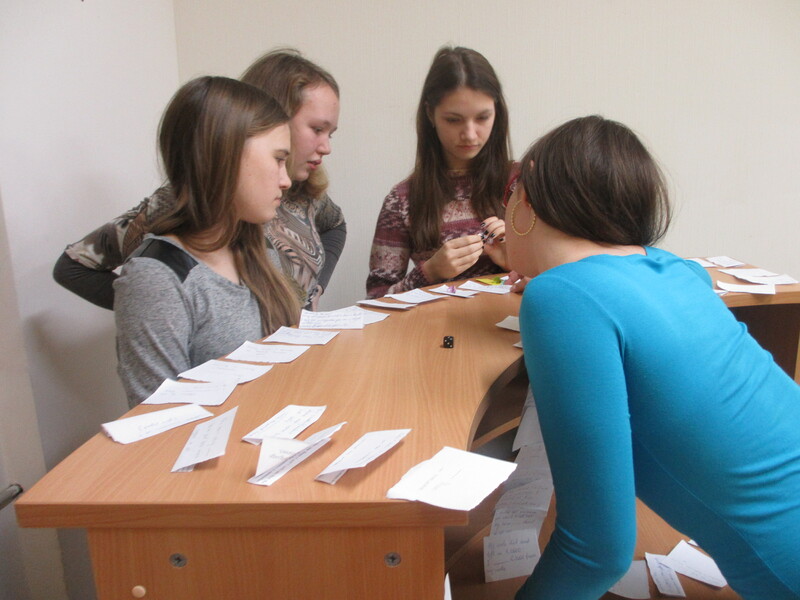 Vocab race: changed student groups so they were working in new threes. I read a definition, students had to find the word in the text, then one person from their team ran to the board to write it. 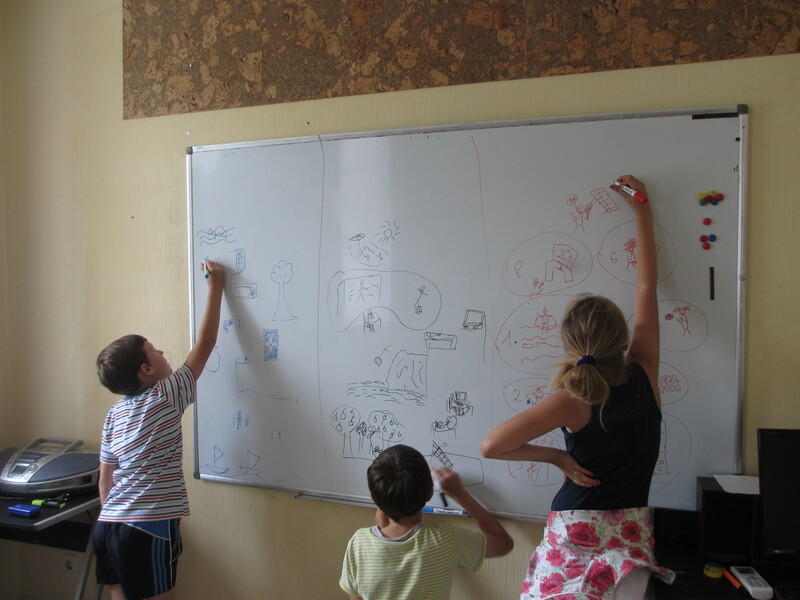 The procedure for the task was clear, and I set up the room to make sure nobody would fall over anything, but I should have made the points system clearer, and drawn lines on the board to show where they should write – one group tried to fill the whole board so the others couldn’t write. Written record: returning to their books, students remembered and wrote the words down. I rushed the set-up of this, and had to repeat my instructions. Speaking: students worked in new pairs (trying to divide up the boys who can be a bit crazy when they work together, and encourage the quieter girls to speak up) to discuss if they’d tried/would like to try any of the dancing/martial arts. To add some challenge, I asked them to see which pair could speak for the longest. They repeated it with a second partner. I could have done a bit of feedback in between the two tasks to make the repetition more useful, but hadn’t come up with anything to tell them! I was taking notes about their confidence when speaking, and some info about what they’d tried/liked. Feedback on content: one student shared their experience of martial arts, and one of dance. Other students were interested in what they had to say, and only those who wanted to contributed – I didn’t force everyone to share something. Setting up homework: students looked at the list of dances and said which three they thought I’d tried. I told them a little about my experiences of dancing, and what I do to keep fit. Their homework was to write 50-100 words about what they do to keep fit – I made sure they wrote it down, and reminded them that if everyone had their homework in the next lesson, they’d get K points. I’m much happier with my lesson pacing now, particularly at feedback stages. They often used to drag, but now I have a range of techniques to call on, and feel like they’re much more appropriate to the stages of the lesson. My monitoring has improved too, which also contributes to making feedback more efficient and useful. Although my activity set-up has improved a lot, and I’ve drastically reduced the amount of waffling I do, I still need to remember to demonstrate activities clearly before setting students off on them. Since this first lesson, I’ve been making a conscious effort to do that (I had lesson six on Friday) by writing it on my plan – I don’t always remember to do that though. I sit down a lot more in my lessons now, and that’s made a real difference to the dynamic in the room. I feel like the atmosphere was quite relaxed and comfortable throughout, but that I could still be authoritative when necessary. I was a bit worried about teaching teens as they haven’t been my favourite age group in the past – I normally prefer adults. However, with the K points system, I feel like I finally have the classroom management technique that was missing from my previous attempts, and I’m looking forward to the challenge of keeping lessons interesting and motivating for the group through the year, and helping the other teachers in our level meeting to do the same. Five lessons later, I feel like I’m getting to know the group well, and am enjoying the lessons a lot more than I expected too. I just hope they are too! This is a very simple two- or three-stage activity I’ve successfully used with small classes of young learners and teens to revise both grammar and vocabulary. They love drawing on the board! Divide the board into a space for each student/team. Ask the students to draw a relevant picture. They shouldn’t worry about their artistic skills, just draw anything that they feel represents the language. Repeat, ensuring they don’t clean the board in between. If you hit anyone with it, we stop. Call out one of the words/sentences. The students hit the relevant picture. 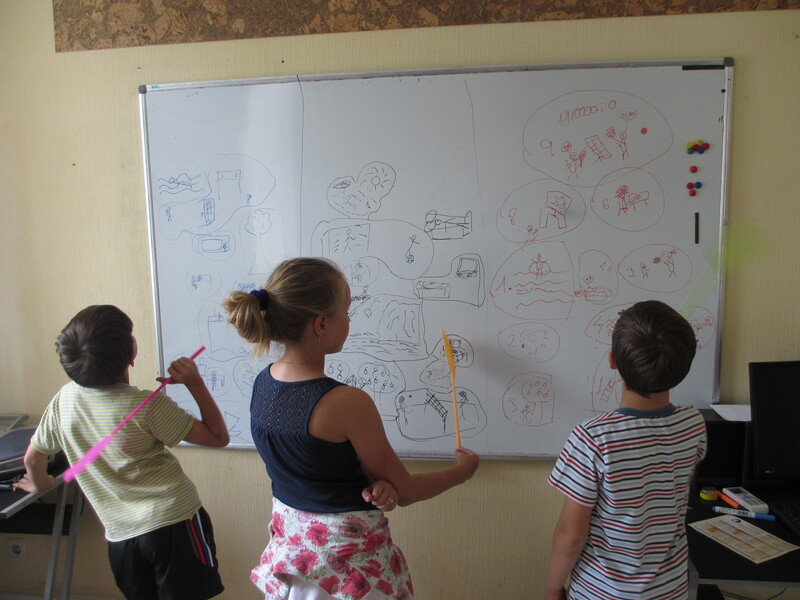 Start with them hitting their own pictures, then move them around – this can be quite challenging if other students have interpreted the language in a more abstract way! You can also ask one of the students to be the teacher. With small groups, you replace them as the player. Repeat stage two, but this time, instead of flyswatters, give the students board rubbers. They clean the relevant picture each time you say the language. When there are only two pictures left, they have to tell you the words/sentences. You can also use paper rolled into a tube instead of flyswatters. Stage two works well with flashcards too. Adults would also enjoy this game. With larger groups it could be done in teams or on paper. Simple, minimal preparation, and lots of fun! Enjoy! I spoke to my students yesterday about why we talk about a reading passage after reading it, and don’t just move on. There are 3 of them, aged 12-13, in that class. When I suggested it might be to help me see how much of the text and the ideas in it they understood, they seemed quite surprised. They certainly weren’t particularly engaged in the topic itself (changes a boy and his family were making to their life to be more environmentally friendly). This is a very simple game which is perfect for revision, and requires almost no pre-class preparation. All you need is some small pieces of scrap paper, some kind of blutack to stick it to the table, dice for each group, and a counter for each student. The blutack is optional, but it does stop the paper from blowing away! 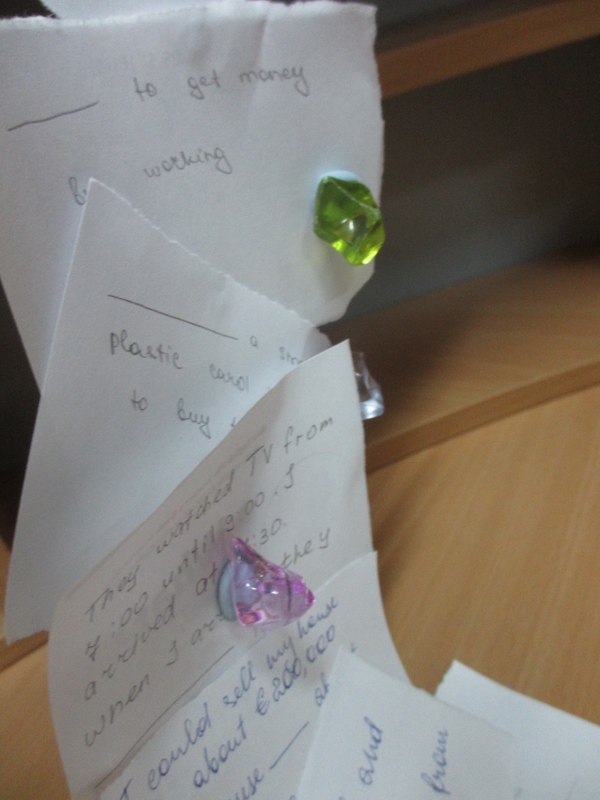 You could use post-it notes instead, but sometimes they curl up making it easy to see the answers! It works best for revising grammar or vocabulary in closed questions. The groups then play the board game. When they roll, they should answer the question they land on. If they’re correct, they can stay there. If not, they have to go back to the question they were on at the start of the turn. The winner is the person who gets to the end first, or who is in the lead when they run out of time. The board can even go up and down! I got this idea from somebody at IH Brno, but unfortunately I can’t remember who. I use it almost every time I’m revising for a mid-year or end-of-year test, and it always prompts a lot of discussion. The group shown in these pictures even asked if we could keep playing it when I said the time was up! I like it because as well as reminding the students of the grammar and vocabulary areas likely to appear in the test, it always prompts a lot of discussion and shows them which areas they still need to revise. I’ve got a pre-intermediate teenage class at the moment, and I’m finding it a bit difficult to engage them in class, so when this activity worked well with them the other day, I was over the moon! My last holiday was in Germany. I went with my friend Catherine. We visited Munich for three days, then went to the Alps. In the evenings we went to different restaurants, and one night we went to the cinema. In Munich we went sightseeing. 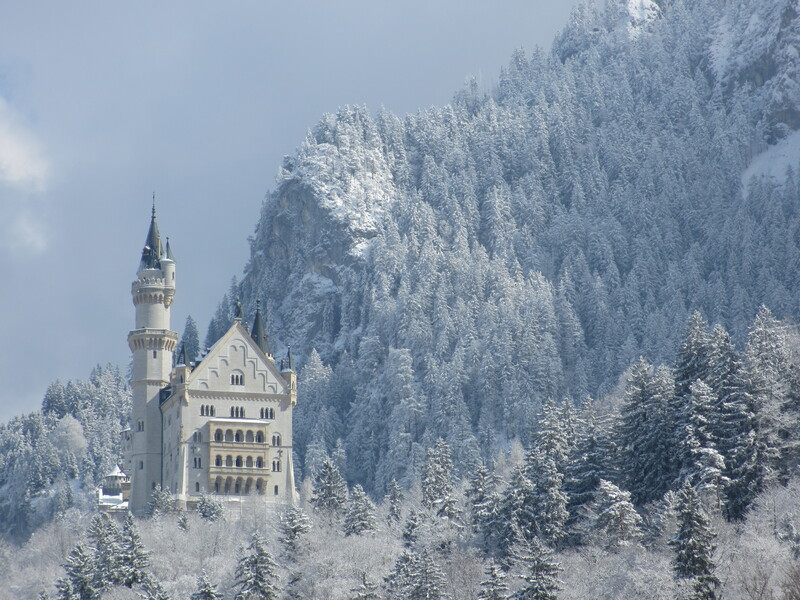 In the Alps we visited two beautiful castles, called Neuschwanstein and Hohenschwangau. We went everyone by train. It was very cold, but the snow was beautiful. I went to my friends’ wedding too. We stayed at two hostels. We didn’t have any problems and we had a really good time. For the next stage I drew a table on the board. It had all of the students’ names, plus mine. I asked the students to think of three words they thought might be in my story and write them down. 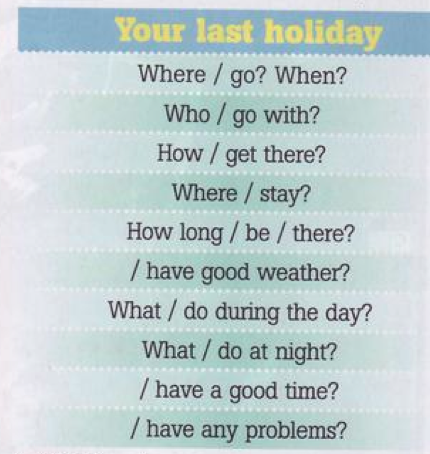 For example, ‘friend’, ‘walk’, ‘beach’. I read my story aloud, and they had to cross out any word from their list they heard. They got one point each for the words they had predicted correctly. I also got points for every word the students had correctly predicted. For example: A got 2, S got 1, R got 0, M got 1 and D got 3, so I got 7. We repeated this around the class. Students with longer stories tended to get more points because there was more chance the predicted words would be in their stories. Once they realised what was going on, the students were competitive, engaged, and eager to read their stories. Russian disappeared completely for the 40 minutes this activity took. For homework, I gave them the chance to improve their stories before I looked at them. Three of them did this (out of five), including one of the students who had been involved in the ‘can I write the shortest’ competition – he ended up writing over 100 words, and it was excellent. This is definitely an exercise I will use again in future, and I hope it’s useful to you as well (if you can understand it! ).